Penn College had its beginning in 1860 when Dr. J. W. Morgan and his brother opened a school named Spring Creek Institute, in a three-story building about three miles from Oskaloosa. After three years, the building burned and the school was held for a time in the Friends' Church nearby, then for a short time in the Yearly Meeting house. The Yearly Meeting of Friends in Iowa soon became interested in this movement for higher education and in 1870, purchased the old campus of Penn College, and planned the erection of the west wing of the old college building. In the fall of 1872 a school known as Friends' High School was opened under the charge of John W. Woody, former president of Whittier College, Salem, Iowa. He, with one assistant, conducted the school for one year. When money was raised to enlarge the work and to increase the endowment Penn College was founded in 1873. The Friends support broadened and the school was organized upon a collegiate basis, with a college charter, a college curriculum, and a college faculty. Penn College was founded by Quakers who believed education to be a necessity in their lives, but public schooling had not yet come to Iowa. When Penn Academy began as Friend's High School on November 5th, 1872. John W. Woody was the first principal with Mary Chawner Woody and Anna Gove as additional teachers. 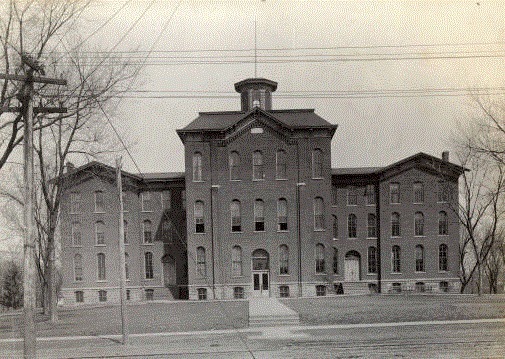 When Penn College opened on September 24, 1873, the high school continued as the Prepatory Department of Penn College. Finally from 1888-89, Penn Academy became its own school, with an independent staff, and Elmer H. Gifford serving as the first principal. Penn Academy started as a two-year school, became a three-year school in 1882, and then became a four-year school in 1911. The Academy was closed in 1927. John Woody served as the College's first president and his wife Mary Chawner Woody was on the faculty where she taught history, rhetoric and served as the first librarian. The foundation of the school was established with the ideology of inclusion and education for all, where women and men were equal as students and as staff, as well as people of color and individuals of any faith were welcome to the college from its origin. Old Main is known as the orginal site of Penn College. The buildings were constructed from 1872-1890 by architect William Foster. During the first year the one completed wing of the building afforded only very cramped and crowded quarters for the one hundred and fifty students; and had it not been for the unfailing good nature of the college family and their community, the story of the college life might have been different. The cornerstone laying ceremony for the east wing of Old Main was in 1890. This last wing of the former college building was funded by the citizens of Oskaloosa. The ceremony was conducted by the Masons. This "new wing" doubled the size of the original building. The location was at 401 College Avenue. Old Main was destroyed by fire on the morning of May 27, 1916, the day of the senior breakfast, the fire began at 3:30 am, the cause is unknown. Robert Williams and Henry Oakley died in the fire when the heavy bell crashed through the building roof. The total loss to the College was $100,000.00, the building was only insured for $22,000.00. After the 1916 fire, Penn College was relocated to forty acres of land to the north, given to the College by Charles and Albert Johnson in 1898. The new location provided an extensive campus for the college. After the fire of 1916, the Penn community needed to rebuild what it had lost. All of Oskaloosa, if not all of Iowa, rallied together to help find money to build a new, fireproof home for Penn College. Students, faculty and staff ran many fundraisers to raise $400,000 needed to rebuild what was destroyed in the fire. Fortunately they were able to secure pledges totaling $425,000.00, and built new facilities at a new location. Penn Hall, Lewis Hall and the Heating Plant were constructed with the promised funds.